I am still around, dear readers! I had been quite busy the past few weeks. We are preparing for a big kitchen remodel and we are trying to do it with a small budget, so a lot of research and talking was needed! The good thing is that we finally get to replace all the 60 year old cabinets, cracking laminate counter with *maybe* green mold, and the odd high cabinet that keeps bumping my tall husband’s poor head! So not much sewing was happening. I was too busy, and the living room with a cute, live christmas tree and sheep skin was too inviting, and my fabric stash was too, uninspiring. So I decided to get some fabric from fabric mart. Some of them are pretty nice find and I would like to share them with you while they are still available! 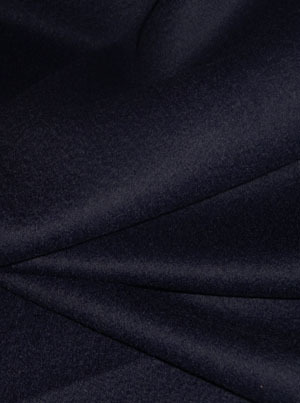 The next fabric is a splurge: navy blue camel hair! I am a sucker for ginko related fabric because I live in a neighborhood where the street is lined with beautiful ginko trees. My backyard actually has one too — and these few days when I look out of my bedroom window, I see a beautiful golden yellow ginko tree with a thick layer of bright yellow leaves on the ground . So I bought this fabric without thinking twice. When I got the shipment, it is totally not what I had expected. 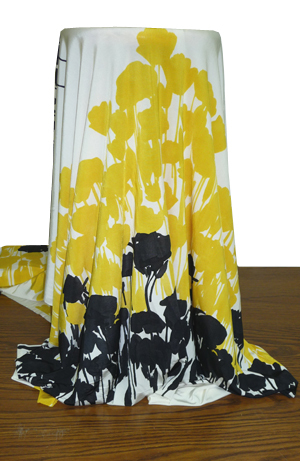 First off — it is not really a border print, the fabric goes black, yellow, white, black, yellow, white and so on. I had imagined that the black leaves would be along the selvage, but no. Also, the material is VERY drapy and very, very heavy. 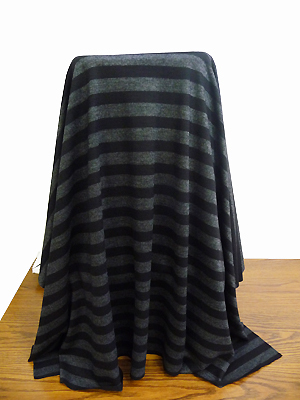 It also has a really cool cold feel to it — I suspect that this would be excellent for a slinky summer dress. It is 98% rayon, but I will have to take their word for it — I would believe it if it was polyester too! Overall, a very interesting fabric that I am going to experiment with in the summer! This entry was posted on Monday, December 13th, 2010 at 1:54 am	and posted in sewing. You can follow any responses to this entry through the RSS 2.0 feed. I love that fabric! And, I remember seeing it on another blog – Carolyn of ‘Diary of a Sewing Fanatic’ made a Flower Power Twinset with it! P.S. Did you see my comment re: hem-marker the other day (https://petiterepublic.wordpress.com/2010/11/14/leveling-the-circle-skirt-hem-the-juebejue-way/#comment-845) I plan on swapping new wood into my own this weekend :)?